It really seems an almost impossible task for any large company to keep a new product under wraps these days. Of course, some corporations have been accused of purposely leaking visuals and information about any new hardware that it has in the pipeline in order to generate pre-release excitement and interest. Whereas others want to keep new smartphones and tablets under wraps, but simply can’t seem to prevent information from seeping out into the public domain. We aren’t exactly sure which category Motorola falls into just yet, but we are now seeing a new video purportedly showing a prototype of the fourth-generation Moto G smartphone. The video has managed to make its way onto YouTube for the world to see, and it actually has the potential to be genuine due to how much it falls in line with previous leaks of the new Moto G that we’ve already been privy to. Given the number of prior leaks and visuals that have already been shared, along with this latest prototype video of the device, have seemed to make Motorola’s Moto G the talk of the smartphone world. Forget the iPhone 7 or the Galaxy Note 6, the budget fourth-generation Moto G is coming. Those looking for a new budget device have already been able to see a number of real life images of the Moto G thanks to some earlier leaked visuals. What’s particularly interesting about this new video reveal is that it may share some design similarities with those images, but there is a glaring discrepancy from the earlier leaks. The phone shown here clearly doesn’t have an embedded fingerprint scanner that lives within the hardware home button of the device as per the earlier leaks. In fact, it doesn’t actually appear to have any home button whatsoever. Of course, the uploader does claim that this is an early prototype of the new hardware so it is entirely feasible that not everything is present and correct just yet. The video does give a good overview of the device from most angles, and therefore should give potential consumers a better understanding of what they could be getting should they wait for the Moto G to hit physical and digital shelves for sale. However, much to the disappointment of many, including ourselves, we don’t get to look at the bottom of the phone to see if Motorola has opted for a USB-C connection, or decided to walk the well walked microUSB path. What we do get to see is the new pill-shaped camera housing which protrudes a bit out the back of the phone which is shown to have a matte finish. The corners of the phone also seem to be more rounded then the third-generation Moto G, but what really makes the phone’s revelation interesting, is when the 2014 Moto X is thrown in for comparison purposes. 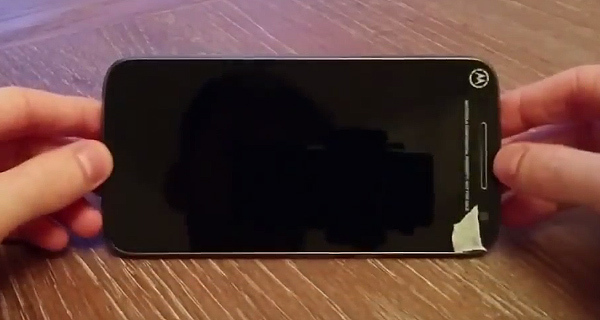 You can clearly see that the Moto G packs a much larger display compared to the previous generation, and even the Moto X.
We’re sure that more information and additional clarity will be provided as time progresses on this one, but till then, check out the phone in the video embedded below.